Tentmaker Pattern 4 [C5613] - $15.00 : Yarn Tree, Your wholesale source for cross stitch supplies. Cross stitch pattern by Carolyn Manning Designs. 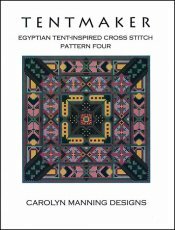 Beautiful colors in hues of green, pink, yellow & blue make up this Egyptian tent-inspired cross-stitch design. The outside border features a blooming flower design before your eyes narrow in on the middle design featuring those deep colors of yellow, burgundy & green. This design would make a beautiful wall hanging. Stitch count 132w x 132h. Stitched on #2936 Aida 14ct White 59" wide or #8221 Aida 14ct White 43".